On Tippecanoe Street, an unusual truck crept east. Every 55 feet, by a small numbered pink flag, it stopped, lowered a disc to the ground and made the earth shake. 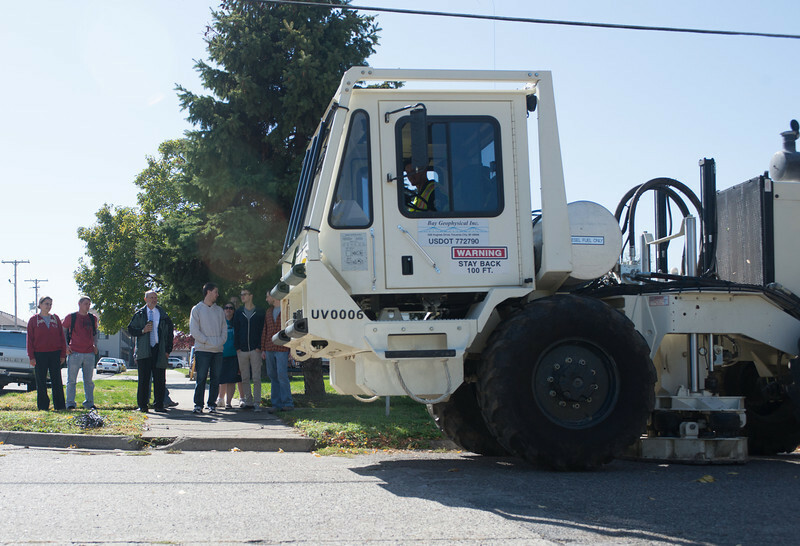 Dan Bradley, president of Indiana State University, professors and students stood on the sidewalk, silenced by the truck's rumbling engine and the generator powering the seismic equipment in the disc. The equipment sends out seismic waves sweeping down to 1,800 feet traveling through rocks, their formations and perhaps reservoirs of oil that lie under the university and Terre Haute. "It's very interesting and exciting for them to actually be able to see oil exploration in progress," Bradley said. "Too many people think meat comes from the grocery store and gas from a gas station. This gives people a chance to see what goes into finding oil." In the late 1800s, oil wells dotted downtown Terre Haute and the land on which Indiana State University now sits. However, as the city grew, most wells were closed. In February, ISU's Board of Trustees approved an oil and gas lease with Pioneer Oil, which will allow the company to develop any oil and gas resources on the university's property. But prior to drilling, the company needs to know where the reservoir is and how much oil may be there. Tests using seismic waves allow scientists to "see" what is underground. The Vibroseis on the truck sends out eight pulses of eight-second seismic sweeps into the ground. The waves react to objects, including sand, rock type and more, and those reactions are recorded via computers. The data is compiled and analyzed to discover what lies beneath the streets, houses and businesses of Terre Haute. "It's not something we have around here very often as far as testing goes," said Keaton Robertson, a junior geology major from Brazil. Mark Wysong, permit agent with Bay Geophysical, which is conducting the testing, explained that the seismic equipment ran at a 12 to 120 seismic frequency while earthquakes register much lower at 3 to 12. "We're at a higher frequency so we're not doing any damage," he said. When the seismic waves pulsed underground, the earth vibrated much as if a large truck rumbled past. "It was really cool to be able to come out and see exactly what is happening," said Nicole Terrell, a senior earth and environmental systems major from Bedford. "I know when people first heard about drilling oil on campus they were really iffy about it, but it's good to come out and see what is happening." That was part of the point, according to Jeffery Stone, assistant professor of earth and environmental systems. He brought his class in stratigraphy and sedimentation to watch the process of peering into the earth. "This is a way to look at what's going on under your feet," he said. "It's one prime way of looking for reservoirs of oil or water or gas." In labs, Stone said, students see the outcome of such tests. "It's good for them to know where the data is coming from," he said. "It's a good experience to see how things operate. A lot of times all they see is the finished product , but now they get to see how it's done and the raw data." The students also attended a lecture by Ernie Hauser, an associate professor of earth and environmental sciences at Wright State University and a 1976 Indiana State graduate. Hauser said he long had a curiosity about the oil under the university. 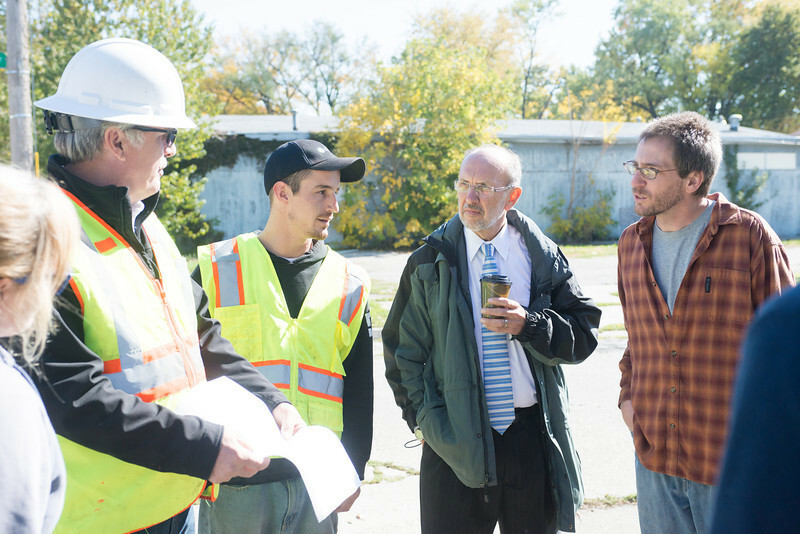 He recalled his advisor and other ISU faculty being called upon when construction crews discovered old wells, such as with the excavation for the foundation of Hulman Center. "They understood what was done in the 1800s and what problems they might encounter with old bore holes," he said. Hauser lectured on rock formations and where oil and natural gas have traditionally been found in Indiana. He also spoke to the students about hyrdraulic fracturing or fracking. Bradley said that the university officials have been told that hydraulic fracturing - a controversial method of pumping chemicals down into the ground to further fracture rock and release oil - would not need to be used. Once the company interprets the seismic data and identifies the structure of the potential reserve, then the drilling can begin. Steve Miller, chief financial officer of Pioneer, said that state laws and regulations prohibit any entity or person from capturing oil from any property where it does not have the legal rights to the mineral interest. If the reserve extends to land where the mineral rights are owned by others, such owners may be able to have their minerals developed and receive royalties, Miller said. Pioneer will pay the university a location fee and the university would receive royalty payments of not less than 15 percent for oil produced. All proceeds will be placed in a dedicated fund separate from university operation accounts and will need board approval before being spent. "The reservoirs are probably only tens of acres, not thousands of acres," Bradley said about the oil potentially beneath ISU. "No one's going to retire from this or move to Hollywood." Seismic data allows scientists "to see" what is under the ground as they search for oil deposits.